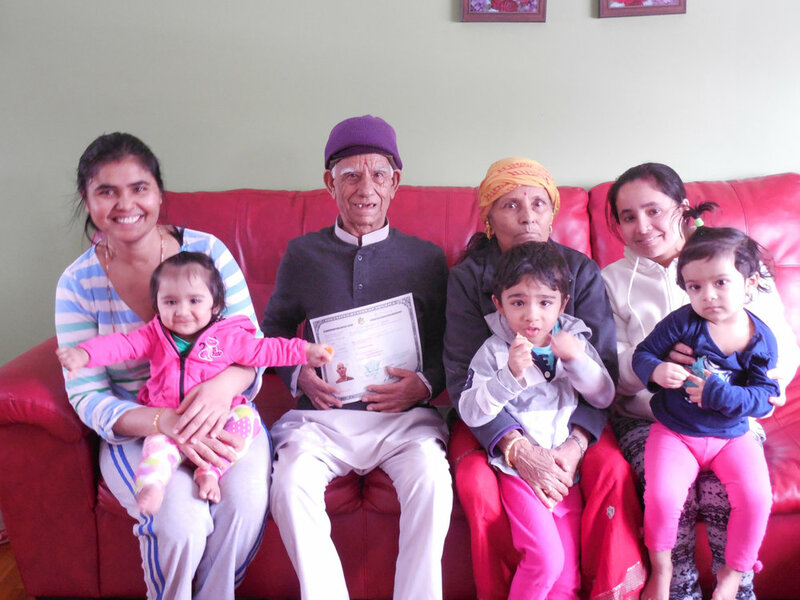 Earlier this month, Ganga Ram Sapkota became an American citizen at 82 years old. Ganga was born July 30, 1933 in the District of Chirang, Goseling Damphu, Bhutan. In Bhutan, Ganga was a farmer and grew rice, maize, wheat, oranges, and peaches. Ganga’s life as a farmer was abruptly stopped when he, his wife Jashoda, and their seven children were forced to leave their country in 1992 because of the government’s persecution and ethnic cleansing of southern Bhutanese groups. After two days of walking, one week in India, and at least one day by bus, Ganga and his family settled in a refugee camp in Nepal, becoming part of the 108,000 refugees who left Bhutan. Over the next 17 years, Ganga, Jashoda, and their children lived in a refugee camp until they were resettled in Cincinnati, Ohio. Ganga married Jashoda through an arranged marriage, which is custom in Bhutan. Ganga and Jashoda had five sons and two daughters while living on their ten-acre farm in Bhutan, before they were forced to leave the country. They have been married 63 years. On January 18, Ganga became a U.S. citizen. We interviewed Ganga to try to understand why he wanted to get his citizenship. Why did you want to get your U.S. citizenship? Ganga: In Bhutan, there was no citizenship. I heard about getting citizenship here. After so many years, I wanted to have my citizenship in the U.S.
How do you feel about having your U.S. citizenship? Ganga: I feel happy that I am permanent now. In Nepal, I stayed 17 years. I was worried at first, but now I am good. Do you ever wish you could visit Bhutan? Ganga: I would like to, but I am not allowed. Ganga: I like the land, the laws and rules, and the freedom of the American people. If someone asks you what your nationality is, what would you say? Ganga: I would say that I was born in Bhutan, I lived in Nepal, and now I am American. What are your favorite things to do in the U.S.? Ganga: If the weather is good, I like to take walks. I like to watch Hindi movies. I also like to do the Hindu prayer ritual called Puja and to sing Bhajan Hindu devotional songs. Ganga: When my first son completed first grade in Bhutan. Here Ganga plays with his granddaughter in his home in Finneytown. Ganga Ram Sapkota comes from a family of seven children with five brothers, Khada Nanda, Chandra Lal, Jaga Noth, Bhim Lal, and Ghana Shyam, and one sister, Dhan Maya. His father’s name was Jaynaran Sapkota and his mother was Punya Mata. Look at how Bhutan’s ethnic minorities fled to neighboring Nepal and India to escape what they call discrimination and human rights abuses. A glimpse of Bhutanese Refugees’ Camps in Nepal.